This is another audio library find. Since I enjoy Agatha Christie's mysteries, I thought I'd give this collection of short stories a listen. Like most short story collections, there were excellent bits and meh bits. The title story The Hound of Death was a little on the weird side. A nun uses memories of a past life to destroy on army. Yep. That's what I said. The stories aren't so much detective stories as stories of supernatural occurrences: ghosts, possession, psychic powers, the afterlife and the like. Not surprisingly, the best stories were more grounded in earthly circumstances, plots of theft or murder. That really is Christie's forte and when she strays into the supernatural it feels fake and in some cases ridiculous. But kudos to her for stretching her writing legs. The best of this collection are The Red Signal, The Fourth Man, The Wireless, The Mystery of the Blue Jar and the best of the best Witness for the Prosecution. These stories have a clever twist that I couldn't see coming. One theme that popped up a lot in these stories was that women, foreign women particularly (especially non-white women) are dangerous, devious and not to be trusted. I thought this was odd considering she was a woman. I wonder if she was bending to the public by writing this way. The better stories outweigh the so-so ones in The Hound of Death and for that I recommend the collection. 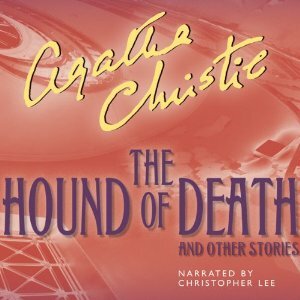 About the audio: Actor Sir Christopher Lee (Dracula, The Lord of the Rings) did a fabulous job narrating The Hound of Death. One of the best audio presentations I've ever heard! He takes on the persona of every character in the stories. His accents are terrific. It was so entertaining. I hope he narrates more books. I enjoy Agatha Christie, but I didn't realize she did stories about the supernatural. You've piqued my curiosity! Neither did I. I was quite surprised by it. How interesting. Short stories sound like a good way to try out Christie's work. I really love Christie's mysteries but have never read her short stories as I'm not really a short story person. Although this one might be worth it just for the narration alone. Thanks for the review! Oh that nun with past life thing sounds awful. But then I've always found past life stories rather silly. Wordless Wednesday: The Book Mobile!